Well now you can enjoy even more of her whimsical drawing ideas in her new title, Zenspirations Dangle Designs, available now and shipping from Amazon. 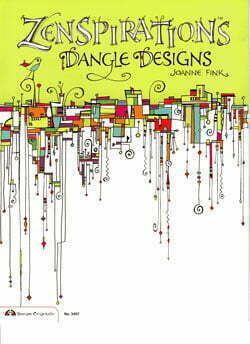 Joanne’s first book contained one dangle design and now this new title expands on the theme, explaining in detail how to draw dangles. Joanne reviews basic materials required, then continues with each term introduced and explained with an illustration and/or step-by-step construction. Project ideas include a “Delightful Dangle Clock” and a “Jeweled Dangle Archway”. Zenspirations Dangle Designs isn’t Zentangle and it’s a small booklet at 16 pages but it’s got lots of bang for your buck. I know you’ll enjoy Joanne’s latest addition to expanding your creative drawing techniques.